The Atelier series is now at the grand old age of 22 (or 20, if you believe Koei Tecmo, which seems to be downplaying its years). To celebrate the series anniversary Gust has developed a new game that puts an interesting spin on the usual JRPG formula. 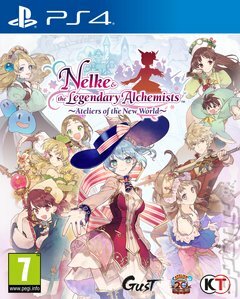 In Nelke &amp; the Legendary Alchemists: Ateliers of the New World you play as Nelke von Lestamm, the daughter of a nobleman who's utterly fascinated by the legend of the Sage of Granzweit, a tale of an ancient tree that's said to grant great power to whoever discovers it. Nelke is, naturally, pretty thrilled when she learns that the tree might in fact be within the borders of her father's lands. He gives her permission to scour the lands in search of it under one condition - Nelke must take on the governorship of the tiny village of Westwald and grow it into a bustling city. Starting with just her father's mansion and a cluster of tents, Nelke must allocate resources, plan building and manage the growth of this small place, nurturing it as it grows and thrives. All the while, she'll interact with famous alchemists from previous games, including those from the Salburg, Arland, Dusk, and Mysterious trilogies! While you're cracking on with that, however, you've got investigating and adventuring to do in a vein that's more in line with the traditional Atelier formula. Don't forget that the Sage of Granzweit is the real prize here!